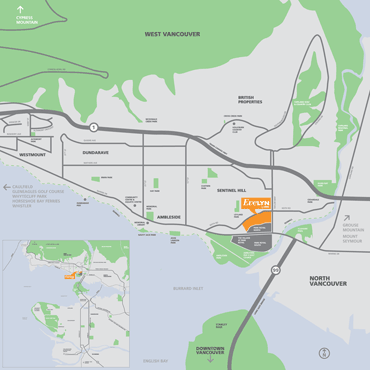 Evelyn is a prestigious new community in West Vancouver, showcasing spacious West Coast modern residences. Architecturally confident, beautiful and respectful, Evelyn is situated at one with nature on a natural rise, an ideal locale perfected by exquisite residential expression. The land surrounding Evelyn offers some of the most breathtaking natural scenery, parks and public open spaces in all of Canada. From the beaches of Ambleside along to Dundarave, to the rocky shoreline of Lighthouse Park through to Howe Sound — framed by the North Shore mountains — West Vancouver is an unparalleled playground. Just a hop, skip and jump from downtown Vancouver, 10 minutes east of Horseshoe Bay ferry terminal and the gateway to Vancouver Island and Whistler, West Vancouver is a cultural paradise as well as the consummate outdoor playground. Evelyn is located above the north side of Park Royal. The shopping centre is divided into two halves, each section with its own unique ambiance and selection of shops. In all, Park Royal boasts nearly 300 shops, services and restaurants including Whole Foods Market, Extra Foods, The Bay, London Drugs, a specialty BC Liquor Store and liberty Wine Merchants as well as a selection of designer stores, practical shops and boutiques. When complete, the master planned community will feature over 300 single family private homes and garden townhomes on West Vancouver’s Sentinel Hill. 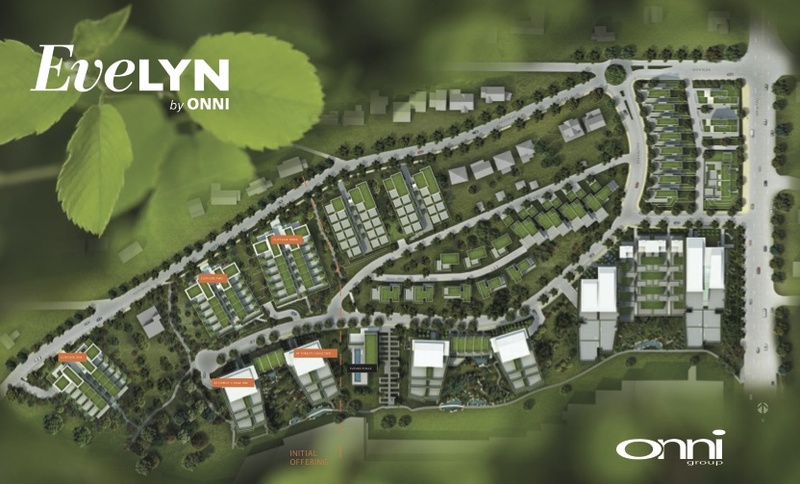 Residing at Evelyn is a park-like living experience. Private terraces provide homeowners with their own garden space, accentuated by the natural surroundings and trees. Homes are organized so that everyone has southern views and ample sun exposure. Meticulous attention has been placed on the ground level experience as well, with water features, wandering paths and pedestrian walkways which are central to Evelyn’s urban expression. Evelyn embodies its surroundings by employing the aesthetic and design of West Coast modernism. With an absence of unnecessary ornaments, Evelyn utilizes a combination of raw natural materials that fit within its environment, creating beauty unique to its setting and embracing nature. The site and building orientation is organized so that everyone has southern views and ample sun exposure. The design provides the comforts of home, while maintaining a connection with the world outside through use of natural light and space. Storage: Included with every home. Architecture: Master planned community; apartments, townhomes and single family residences. Neighbourhood: Located in West Vancouver, north of the Park Royal Shopping Centre. Easy access to Downtown Vancouver, Horseshoe Bay and North Shore mountains. If you’d like to know more about this amazing new West Vancouver real estate development or if you are thinking of buying or selling your home, please do not hesitate to email James Chung, Vancouver REALTOR®, at [email protected] or call ( 6 0 4 ) 7 1 9 – 6 3 2 8 today!